By Kori ~ August 18th, 2008. Tom Klein, owner of Rodney Strong Vineyards, truly believes that Sonoma County, California, has the capacity to grow grapes and produce wines that compare in quality to anywhere in the world. Spurred by this belief, he has embarked on a mission to craft wines at the highest level and over the last ten years, he and his team have replanted or purchased high quality vineyards, including Rockaway Vineyard, in the northern part of Alexander Valley. The Alexander Valley AVA is located in northeastern Sonoma County. Also, in 2005, he added a â€œwinery within a wineryâ€ concept to the Rodney Strong portfolio to focus on small-lot, artisan winemaking. The debut release from their â€œwinery within a wineryâ€ is the 2005 Rockaway Cabernet Sauvignon. Rockaway is completely made from free-run juice from the best rows and vines in the vineyard. Their goal is for it to be the ultimate expression of terroir because they believe that place is, above all else, the most important factor in quality wine. Rockaway is the first in a series of three single vineyard Cabernet Sauvignons to come from Rodney Strongâ€™s â€œwinery within a winery.â€ There will be two from 2006 and three from 2007 and going forward. In order to properly evaluate this wine in light of the competition it will face upon release, we opened a bottle of 2005 Paul Hobbs Cabernet Sauvignon from the Napa Valley to see how it would fare. Both are California Cabernets that retail for around $75, and Paul Hobbs is a well-known, highly acclaimed, established brand. While Napa has the greater reputation for high-quality wines, many critics believe that northern Sonoma County, particularly Alexander Valley, compares very favorably to parts of Napa Valley. Based on this tasting, I would agree. While these wines are definitely different, I give them both a 4-star rating with a slight nod to Rockaway. And while $75 is a lot of money for a bottle of wine, they both have a 4 bangs-for-your-buck QPR rating since the average price of a 4-star New World Cabernet Sauvignon in our database is $120. If you can handle the price point and are looking for a top-flight Cabernet Sauvignon, Rockaway is a great opportunity for you to get in on the ground floor with a new allocated brand. 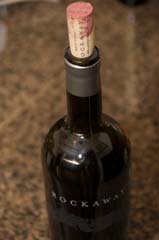 2005 Rockaway Cabernet Sauvignon (Alexander Valley, Sonoma County, California): 92% Cabernet Sauvignon, 4% Malbec, and 4% Petit Verdot. Inky, dark garnet in color. Pleasant aromas of blackberry and plum. Almond and licorice come through on the palate along with a very distinct smoky component. Bold tannins with a long finish. Should improve with age. Side note: Packaged in a heavy glass bottle with a deep punt. Has a very classy appearance. I received the Rockaway as a trade sample. In a first in the industry, Rockaway was pre-released to a select group of wine bloggers before it was released to the print trade publications. For other reviews and stories, visit the sites of my fellow participants who will be posting about Rockaway sometime this week: Deb from Good Wine Under $20, Tim from Winecast, Renee from Feed Me/Drink Me, Joe from 1Wine Dude, Jeff from Good Grape, Arthur Black (Master Sommelier candidate) guest blogging at Good Grape, and Megan from Wannabe Wino. Great summary of this wine. I hadn’t thought to mention the bottle / presentation (which is quite classy, as you noted).